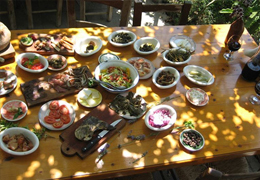 For centuries, Cypriots have accompanied their drinks with meze – a large selection of delicacies consisting of many dishes with small helpings of delicious foods. Meze are a traditional feature of religious feast days, birthdays, weddings and name days. Feasting usually means endless eating, singing and joking, accompanied by wine and zivania, a strong spirit similar to vodka. Served all over Cyprus, mezedes cover a broad range of some the best of local cuisine and can include up to 30 dishes. The feast begins with black and green olives, tahini, houmous, skordalia (potato and garlic dip), taramasalata (fish roe dip), and tsatziki, all served with a basket of fresh bread and a bowl of village salad. 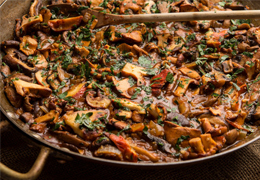 Some of the more unusual meze dishes that may be served include octopus in red wine, snails in tomato sauce, brains with pickled capers, kappari (capers) and moungra (pickled cauliflower). Bunches of greens, some raw, some dressed with lemon juice and salt, are a basic feature of the meze table. The meal continues with fish, grilled halloumi cheese, lountza (smoked pork fillet), keftedes (minced meatballs), sheftalia (pork rissoles)and loukanika (sausages). It is then the turn of kebabs, lamb chops and chicken. 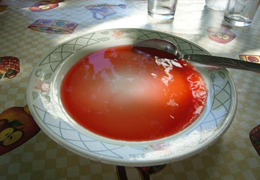 The last dish to be served is fruit or the traditional preserved fruit glyko. Glyko is found in every home and is the first thing to be offered to a guest together with a glass of water. Some of my favourite Cypriot foods are Kleftiko: slow cooked lamb shank, often served with potatoes. 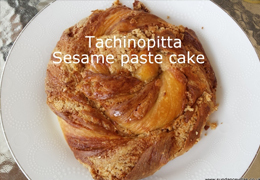 “Tashinobitta” a sweet sesame paste golden flat cake. Papantoniou sell a good version, and it is out of this world when still warm. Water melon with crumbled fetta cheese and finely chopped mint, lovely on a hot day. Souvla, chunks of BBQ lamb or goat cooked on the bone. If you want to buy Trahanas (for soup) or Shoushouko, (candle shaped rose water sweet with almonds or walnuts in the centre) try to buy village made as the shop bought Shoushouko has very few nuts and artificial flavour although it looks the same. Home-made produce can be bought in villages like Statos-Agios Fotios near Agia Moni monastery, but you need to know who to ask as you will almost certainly be directed to a house or local shop. Trahanas is prepared in July and Shoushouko just after. They both freeze well. Please contact Nicole on mobile 99 599956 regarding this as she has contacts or ask Nick or George at Cy Breeze car hire. One heaped teaspoon of coffee is added to each demitasse of cold water. The sugar is added while the water is still cold. The amount depends on whether you want your coffee sweet “glykis”, medium “metrios”, or unsweetened “sketos”. Irene’s current favourite Cyprus red wines are Kolios winery Status 99 and Zambartas Lefkada. Also Kolios Cornetto Rose medium, full of flavour. As you are staying in the Paphos region you have access to some good wines from the smaller local wineries, who are using up to date modern equipment and methods. You can taste the wines and buy direct at good prices. We recently went to Crossroad Cava in Paphos for some wine tasting and filmed a little vlog, click here to watch it. Lunch and wine tasting: 2 excellent Paphos wineries are now offering pre bookable lunches, very highly recommended. Vouni at Panagia tel. 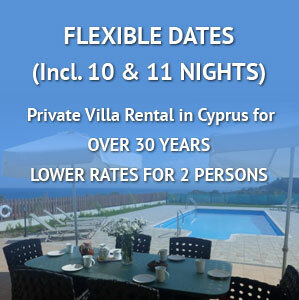 357 99 453 138 mobile and Kolios at Statos-Agios Fotios, Telephone: +357 26 72 40 90 Mobile: +357 99 47 93 30. Fantastic views at both, but certain tables have better views. Must book. Top Tip: I recommend you call your Rep to pre book you a table with a good view. Both are wheelchair accessible. Kyperounda in Limassol, +357 25 53 20 43 Mobile: +357 99 58 96 12, 99 61 33 62. Vlassides in Limassol, +357 99 44 15 74. You can of course visit these wineries alone or go on a Cyprus Tourist Office (or other) wine tour. P.S. Tip: If you’re just ordering a GLASS of wine somewhere, the village RED is almost always better than the village WHITE. If faced with a wine list, tell the taverna owner/waiter which taste/grape/wine you like at home, order a bottle and take the rest home with you! And just in case you cannot find these wines, you may be able to get white fruity Thisbe, a reliable white from a large Limassol winery, Keo.